As planned, we left the hotel this morning at 7 a.m., intent on photographing sites of architectural and historic interest in downtown St. Louis. At the same moment we began our journey to the city center, almost 25,000 runners left the starting line in a half dozen races all around the city as part of the GO! 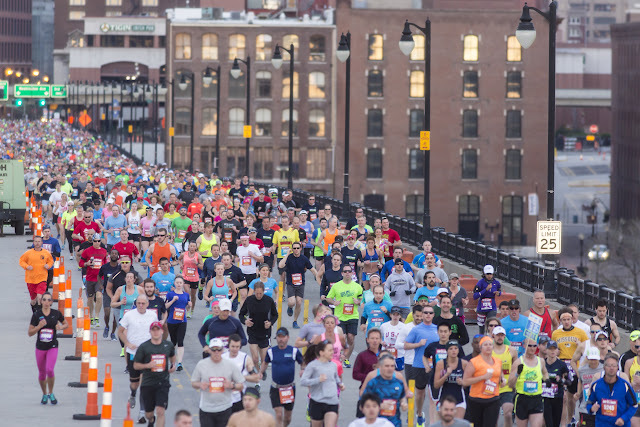 St. Louis Marathon and Family Fitness Weekend. We arrived downtown to find a snarl of traffic attempting to navigate a patchwork quilt of street closures accommodating the courses for the marathon (3,000 runners) and half marathon (12,000). Recognizing an epic planning failure when we saw it, we retreated to the ‘burbs with our camera between our legs. Since we had skipped breakfast, we decided to go by Whole Foods and graze off their breakfast bar. But, oops! The store didn’t open until 8 a.m. A pattern was setting in. It was time to pack up our tents and leave town. Springfield, Illinois was our next stop, and there was no reason to delay our departure. Leaving St. Louis, the GPS took us through an area called Wells-Goodfellow on the northwestern edge of the city. As we drove on Goodfellow Boulevard through the area, we passed entire blocks of abandoned row houses, either boarded up or with windows broken out. Occasionally we saw a person or two in the area, an isolated occupied home, but primarily desolation. Even the commercial buildings were empty, save a couple of car washes and a rogue barber shop. Sadly, Wells-Goodfellow, which was once a thriving, prosperous neighborhood, is now the very picture of urban blight. Continuing to avoid freeways, we drove out Goodfellow to MO-367, where we turned north, driving through Jennings, Moline Acres and other St. Louis suburbs, until we connected with US-67 near Florissant. After crossing the Missouri River, we were just six miles from the Mississippi River. As we were about to cross into Illinois, we caught sight of the Lincoln-Shields Recreation Area on the Missouri side of the river. 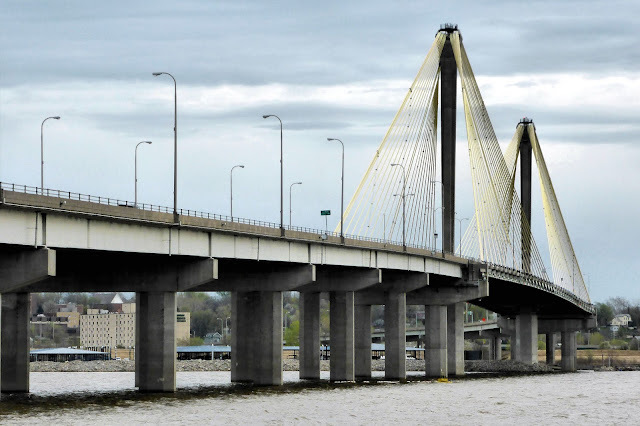 Our intention was to drive into the park and snap a photo of the Clark Superbridge, a cable stayed span that carries US-67 across the Mississippi to Alton, Illinois. Named for explorer William Clark, whose expedition passed this way, the bridge opened in 1994. Cables on the bridge are wrapped with four acres of yellow plastic piping, giving it a distinct canary look. 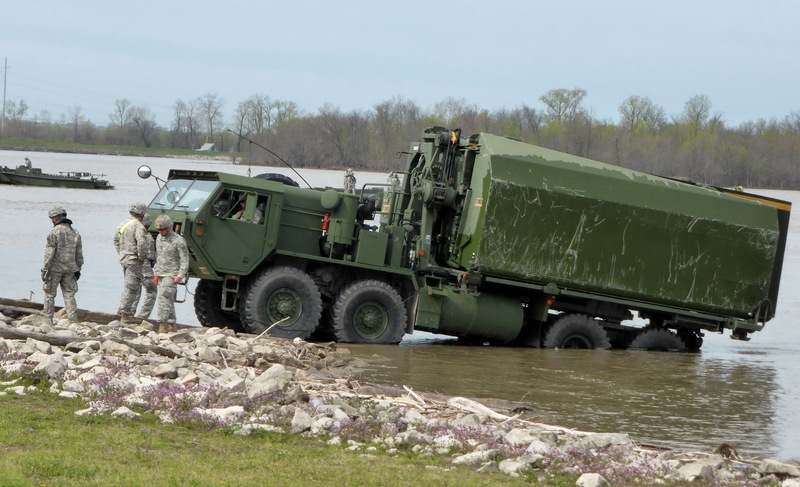 Little did we know we would spend the next half an hour watching an Army Reserve bridge company disassembling a ribbon float bridge in the Mississippi River. Sorry we didn’t arrive in time for the bridge assembly practice, we watched in fascination as the reservists brought their equipment out of the water and loaded it on waiting trucks, proving yet again that we are easily amused. While we watched, we spoke briefly with a friendly young soldier from Arkansas, who clearly has an affection for his work in temporary bridge building with the Army. A teacher by nature, he explained various types of bridges he has worked with. This company is based in Granite City, MO, and is one of just a handful of units with this specialized training. 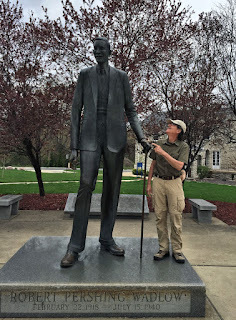 As we drove through Alton, IL, at the other end of the Clark bridge, we stopped to search for a letterbox honoring Alton’s tallest citizen, one Robert Wadlow (1918-1940). Young Wadlow still holds the record as the tallest human ever recorded, with a height of 8’11”. Due to a physical aberration, Wadlow’s pituitary gland produced an abnormally high level of human growth hormone. He was still growing when he died of an autoimmune disorder after an injury at age 22. 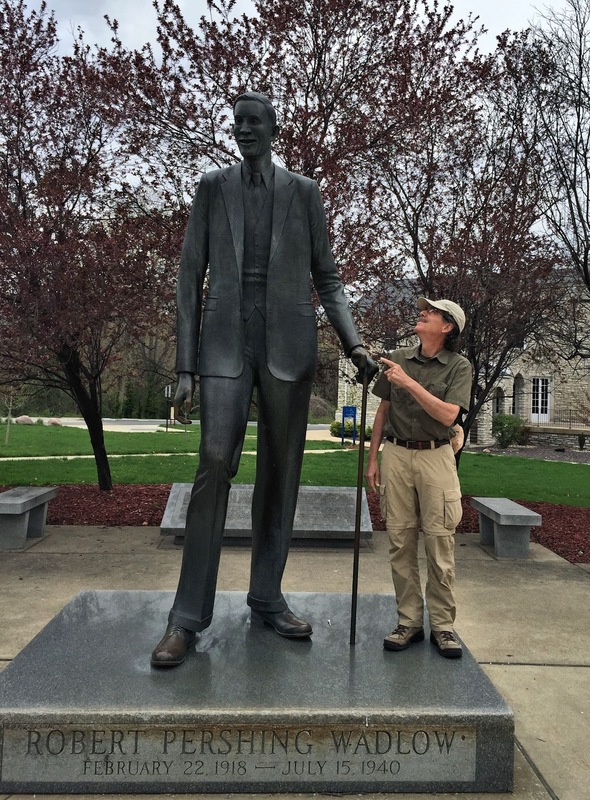 Near the letterbox location, a small pocket park features a life-size statue of Wadlow, inviting visitors to compare their height with his and examine the length of his gargantuan size 37 shoes. Winding our way toward Springfield on IL-4, we passed through numerous small but interesting towns—Gillespie (pop. 3,412) with its ornate and stately courthouse; Carlinville (pop. 5,851), home of Standard Addition, a neighborhood with 152 Sears mail order homes; and Virden (pop. 3,488), the location of a deadly coal miner strike and battle in 1898. Arriving in Springfield just before 5 p.m., we went directly to the state capitol for some exterior photography. Timing was perfect as the nearby streets were virtually deserted. Later in our room at the Fairfield Inn, we realized that the Frank Lloyd Wright house we wanted to see will not be open until Wednesday, so we can see the statehouse tomorrow and move on instead of spending two nights in Springfield. When we began looking for a hotel room in Chicago for tomorrow night, we were put off by what we considered excessive prices for this week. After finding rates less than half that in coming weeks, we realized that Chicago must be hosting some special event this week. So we decided to change course and drive north to the Mississippi Headwaters in Minnesota first and hit Chicago on our way back south. 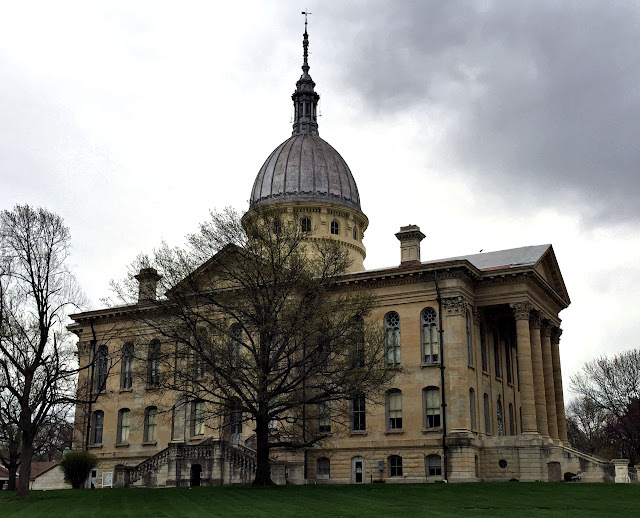 Tomorrow we’ll visit the Illinois State Capitol and move on north toward Minnesota. Two of the remaining 152 mail order houses from Sears still in Carlinville. Every item needed to build the house, including nails, was included in the mail order package and shipped by rail.